Wildlife and Nature Pictures -The Greater Kudu - Large Antelope of South Africa. The wildlife on the African continent as we know is numerous and varied, South Africa is no exception with many wildlife species. One of the largest species of antelope in Africa is found in South Africa, it is the Greater Kudu (Tragelaphus strepsiceros). The 'Greater Kudu' antelope is one of 2 species of Kudu antelope found in Africa the other being the 'Lesser Kudu' (Tragelaphus imberbis) which is found more towards Africa's eastern side, as well as the 'Greater Kudu' already mentioned. If you come southwards however to South Africa's Kruger National Park you will see throughout its vast 2 million hectares great numbers of the 'Greater Kudu', as well as the other national parks and nature reserves South Africa has to offer. All over South Africa you will see large numbers of these stunning antelope. Male 'Greater Kudu' antelope typically are about 200 cm (7 ft) in length, stand approximately 165 cm (65 in) tall at the shoulder and weigh in at a 'hefty' average of about 230 Kg or well over 550 lbs. Female 'Greater Kudu' on the other hand are considerably smaller, standing only about 100 cm (40 in) to the shoulder and weighing in at about 170kg or well over 300 lbs. 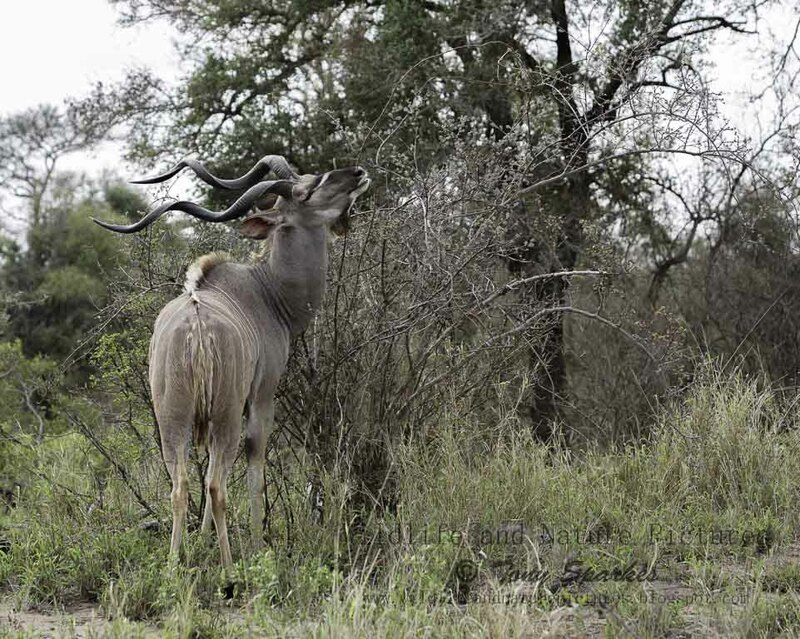 The male 'Greater Kudu' is easily distinguishable from most other antelope as it has 'impressively' long spiral/twisted horns (usually about 2.5 twists) that on average reach about 100 cm (40 in) in length which also slant back slightly. Another distinguishing feature can only be described as a 'mane' along the throat of the male 'Greater Kudu' also very large forward pointing ears on both the male and female. 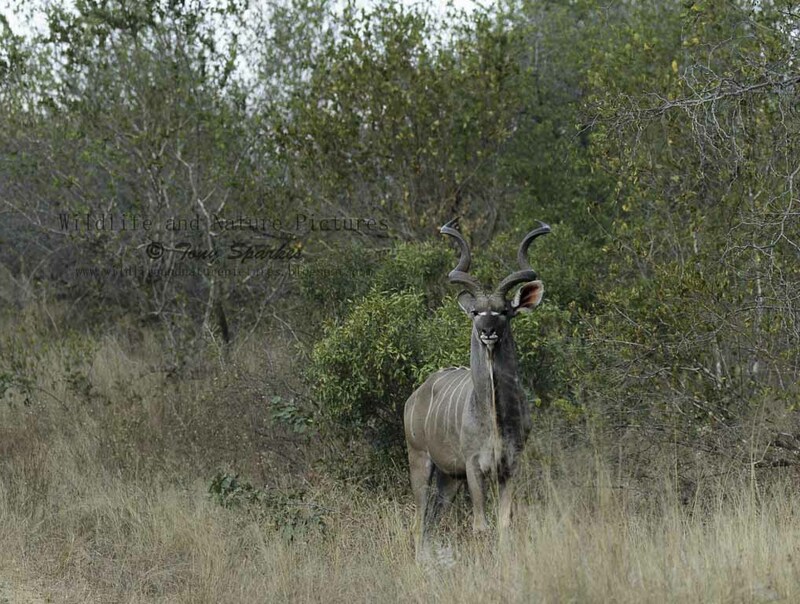 'Greater Kudu' are what we describe as a 'browser' antelope and not a 'grazer'. What this actually means is that they 'pick' or 'browser' their food stuffs from tree's, bushes and shrubs, sometimes taking fruits. A grazer on the other hand takes their food from grasses and foods stuffs that grow and form along the ground. Female 'Greater Kudu' are normally found in small herds with their calves of around 5-15 individuals, with males being normally solitary, although they do sometimes form an all male 'bachelor' group. They are often preyed upon by Africa's large carnivores the Lion, Leopard, Hyenas and Wild Dog, in-fact only a few weeks ago a female 'Greater Kudu' succumbed to a Leopard on the game reserve where I live, mother nature at work.